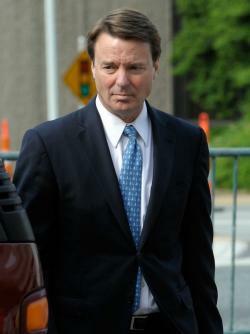 The John Edwards trial: Why it was so dull. There were no big revelations in the John Edwards trial. That’s why he can lose. Photograph by Sara D. Davis/Getty Images. The grade-A dynamite evidence in the John Edwards trial, Exhibit 128, was a letter from the reclusive heiress Rachel “Bunny” Mellon, dated April 21, 2007, and addressed to Edwards’ body man/consigliere/sycophant Andrew Young. Mellon was incensed at a Politico scoop about her candidate billing a pricey haircut to his campaign. “It inspired me,” she wrote. “From now on, all hair cuts etc. that are necessary and important parts of his campaign … Please send the bills to me c/o Alex Farger in N. York. It is a way to help our friends without government restrictions. Bang. This, according to government prosecutor David Harbach, proved that Mellon was intending to dodge campaign finance laws. The letter was the gorilla glue in the government’s June 2011 indictment of Edwards. If Edwards goes down—the jury started deliberating today—this will be why. Mellon, according to the government, was the enabler of a massive conspiracy. But figuring this out didn’t take a lot of digging by prosecutors. Mellon’s letter appeared in Young’s February 2010 cash-grab memoir, The Politician. Young described a letter “written in delicate script on pale blue stationary,” and explained what it promised. Mellon eventually cut six checks with phony memo lines (“antique chair”) to pay for the lifestyle of Edwards’s pregnant mistress, Rielle Hunter. The most surprising fact about the John Edwards’ trial is how unsurprising it was. In two years and three months, over the entire discovery period, the government’s prosecutors found nothing better than this letter. The government evidence is clickable at this link (PDF). It’s heavy on innuendo and heavier on embarrassment. It’s awfully light on examples of clear-cut campaign finance abuse. The trove of recorded calls from John Edwards reveal that he was secretive= —“Elizabeth will probably be here in about 15 minutes, so the sooner you get this the better”—but not that he was directing his own conspiracy. This, too, was in the Young memoir. The “most heart rending moment of the trial,” according to ABC News, came when a former Edwards ally testified about the candidate and his late wife having it out on “an airport tarmac,” Elizabeth Edwards tearing off her blouse to shame the scoundrel. Hearing the story in court caused their daughter, Cate Edwards, to tear up and bolt out. But the story was well known to readers of The Politician: It was on page 142. The prosecutors had great material. But they had nothing new to prove that Edwards violated campaign-finance law by letting Bunny Mellon and Fred Baron bail out Hunter. To do so, Edwards needed to take unregulated, secret money “provided for the purpose of influencing the presidential election.” Did the $900,000 of Mellon/Baron cash qualify? The best evidence came from Young. In his memoir, Young dates the cash-for-Rielle plan back to a mini-crisis in 2007, when Elizabeth Edwards got too curious about an expense someone had made in New York when her husband was on the West Coast. Young shelled out for Hunter’s expenses. Edwards “promised I would be repaid when a wealthy benefactor was recruited to cover these costs or when Mrs. Edwards died.” Months later, the wealthy benefactors were found. Pure sleaze, but did it represent a campaign-finance law abuse? Edwards told his aide that he would paper over the Hunter expenses with the help of dupes. The key dupe, Mellon, offered the money for “necessary and important parts” of the campaign, as they related to Edwards himself—expenses like his haircuts, a part of his livelihood that was billed to the campaign only by accident. Young and Edwards took her for a ride, but as Richard L. Hasen pointed out when the trial began, the FEC precedent that does the most for the prosecution claims that friendly cash isn’t a “contribution” if “gifts of a personal nature… had been customarily received prior to candidacy.” Mellon had opened her checkbook for Edwards’s causes before he made the 2008 bid. Edwards subsequently used her to cover up his personal life. Still, the prosecution may have done enough. According to the jury instructions from Judge Catherine Eagles, “The government does not have to prove that the sole or only purpose of the money was to influence the election. … People rarely act with a single purpose in mind.” The jurors’ job is to determine whether the money was provided “for the purpose of influencing an election.” The Mellon letter expressly says that she’s thinking about “the campaign.” Bang. You can see why Edwards’s defense team rested without letting their client speak for himself. The prosecution merely needed to remind jurors of the many colorful ways in which the Man Who Might Have Been Vice President disgraced himself. He duped Mellon liked he duped everybody else. You don’t need a new story to send him to jail.